The Canadian wildcross fox is native to North America and it is a Canadian red fox, but with a unique, natural color. The hair of the wild cross fox is very similar to the more well-known Canadian red fox and differs only in the coat color and shades. The fox population is controlled by professional hunters to control overpopulation. One of our primary objectives is to make sustainable use of existing resources and reconcile them with nature. If you decide to purchase a product from Canadian wild cross fox, you can be sure to receive a high-quality natural product from controlled hunting. We produce Wildcross fox blankets, fur pillows, and accessories. If you have any questions, please do not hesitate to contact us. 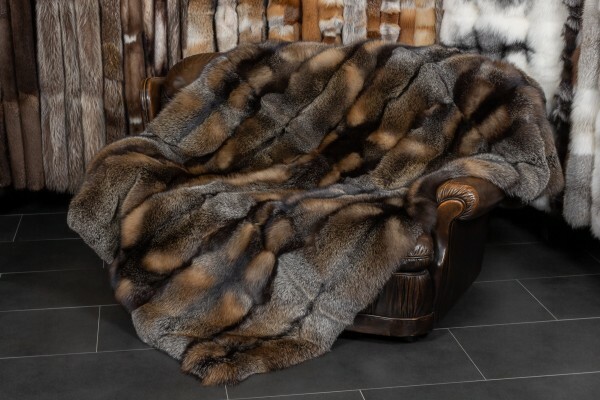 Related links to "Wild Cross Fox Fur Blanket from Canadian Foxes"
Customer reviews for "Wild Cross Fox Fur Blanket from Canadian Foxes"
Thank you so much for your email and the information you provided. I live in a rural area and it was important to know when the shipment was coming. I received my package this morning, it arrived a day earlier than anticipated. Both the fox blanket and the stole are beautiful and I am very pleased with my purchase! The packaging was excellent and the quality of your company can be seen in all aspects of this transaction. I will certainly purchase from you again in the future.